Today’s IT companies are driven by continued data growth and economic pressure of huge amounts of data that needs to be stored on storage devices for fast access. Moving this data to lower tier devices like tape or optical devices (CD or DVD) is only a partial solution. 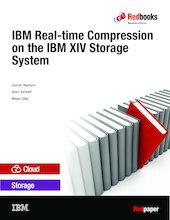 IBM® Real-time Compression™ fully integrated in the IBM XIV® Storage System Gen3 with software 11.6 is the answer to this challenge. It provides the possibility to store 2 - 5 times more data per XIV system, without additional hardware, and effectively reduces software cost. This technology further extends the storage-replication-related bandwidth and decreases OPEX. BM Real-time Compression uses patented IBM Random Access Compression Engine (RACE) technology, achieving field-proven compression ratios and performance with compressible data. This IBM Redpaper™ publication describes the benefits of implementing IBM Real-time Compression.